This is great, some might say, a few streets in the city that are actually good for driving on. However there are some negative consequences as well. Consider that trying to cross the street feels like an unsafe maneuver at almost all of the intersections that don’t have traffic signals and even at some of the intersections that do have signals. Consider that bicycling down a street with speeds means that only the fastest riders will consider using it as a route. Consider that for businesses on NE Broadway and Weidler they have less customers because there isn’t a compelling ‘place’ drawing people to the area to enjoy their days, evenings and weekends due to the street feeling unsafe and unwelcoming. A great street feels like a public room where a busy road feels like an impenetrable wall. Broadway is more towards the latter. In that same vein, a presenter at the Better Blocks Kickoff Party asked a number of folks “Who here would take their out of town guests to Division street to spend time?” Many hands went up. “What about Williams? Hawthorne? Alberta? Mississippi?” Many hands. ‘NE Broadway’ – no hands. People don’t think of Broadway as a place to go to for fun, a place to spend their money, or a place to show off. Why is that? Well there are a number of factors that go into making a successful place. Creating an inviting environment for people requires a lot of hard work and cultivating all the right ingredients. Street seating, people window shopping, a friendly pedestrian environment, many eyes and ears on the street keeping it a safe place are all important pieces of the puzzle. A street with extra pavement is uninviting, but a street with wider sidewalks can help make it a fun place to be. Currently, we have a bunch of vacant storefronts, empty lots, car dealership holding lots, and drive-thru windows along Eliot’s stretch of Broadway (west of 7th). A bit farther east there is a destination in the Safeway, the mall is a block off of Weidler, and there is a bit of a successful commercial node around 15th Avenue. But that’s about it as far as continuously used store frontage. There are a few fun shops on Broadway but they aren’t at the density needed to create a thriving commercial district. This summer, a relatively new Portland street activation group called ‘Better Block PDX’ will be transforming 4 spaces around the city to be less car-dominated than they currently are. Previously they repurposed the east-most lane of Naito Parkway along the Rose Festival for several weeks last year, and they did a big demonstration along NW 3rd avenue that has become a permanent bicycle lane and roadway narrowing project. The group has had quite a bit of success and is now partnering with Portland State University students to install demonstrations of street reconfigurations. On NE Broadway, 1 lane of car traffic will be repurposed for 3-10 days during May so that 2 travel lanes will exist instead of 3. 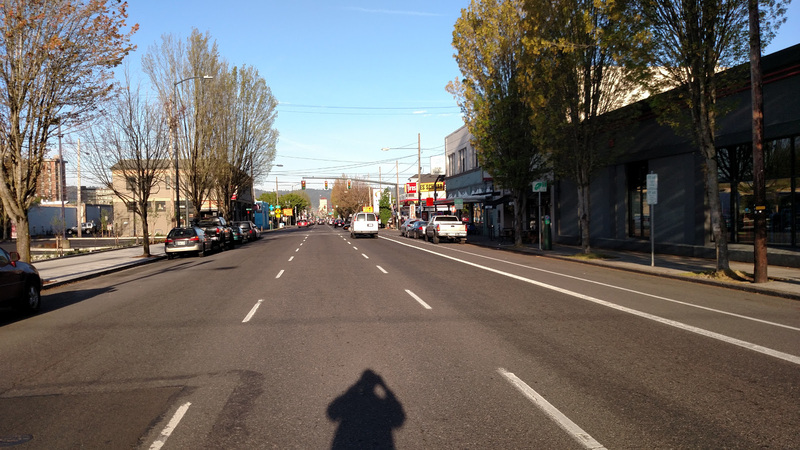 Maybe this will be the start of permanent changes on NE Broadway that will help bring revitalization to the corridor. It might even be easier to walk across the street. My daughter and I would like that.